I don’t exactly know how to describe a persimmon to someone who hasn’t had one before, but I can try. It’s sweet but not cloying, and moist but not juicy. The flesh is firm and buoyant, somewhere between a Bosc pear and a sweet plum. The dry sweetness, too, reminded me of a plum/pear hybrid tempered with the sugary crisp sweetness of a ripe apple. The inside of the fruit is beautiful. I don’t know what I expected, but not the beautiful simplicity that it contains. Cut a persimmon in half widthwise and it reveals a thin, neat, starfish shape. There are no seeds or tough bits; you can just bite right in to it. It’s one of my new favorite fruits. I let the persimmons ripen for a few days before using them since the interwebs helpfully informed me that the fruit can be bitter if underripe. I couldn’t tell you if they were ripened “enough”, but I can tell you they tasted fantastic on their own, and even better when eaten with this moist, hearty cake that is flavored with rich, slightly spicy extra virgin olive oil and warm winter spices. Actually, in my mind, these persimmons started out baked into the cake. When I tried that, though, they tasted great but got kind of soggy in the middle of the cupcake. I made about 100 versions of this recipe before I realized that the persimmon may get a little lost in the cake when cooked, but, when raw and grated, lends a subtle sweetness to the frosting that perfectly complements the bite of the bourbon and vice versa. 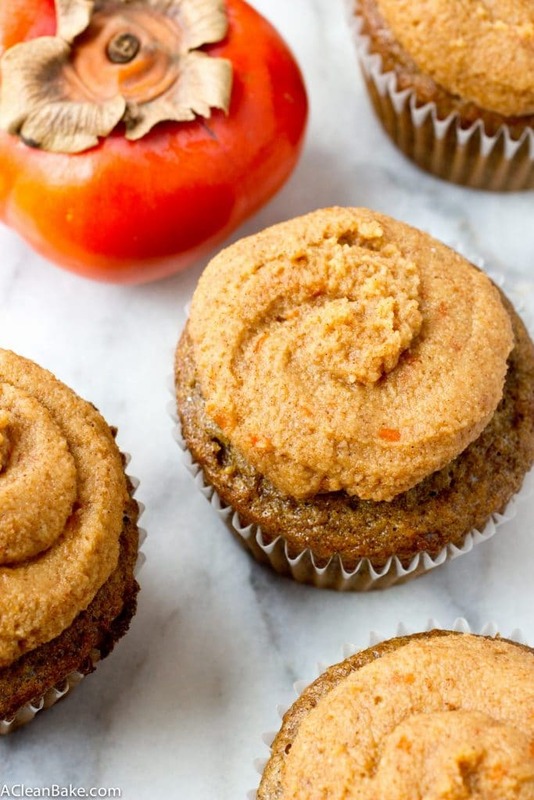 The grain-free olive oil spice cupcakes are made from a mixture of almond flour, coconut flour and tapioca flour which produces a soft, moist, bouncy cake that is a pleasure to bite into. The frosting is completely dairy free, vegan and gluten-free, made from a base of coconut cream and coconut flour. But don’t be turned off by the flour – the frosting isn’t gritty or dry the way “flour” would imply. Like the cake, it’s soft and moist (sorry I keep saying that word) and flecked with bits of persimmon, creating a sophisticated, slightly unexpected flavor for this wintery treat. Preheat the oven to 350 and line a 12-cup cupcake pan with papers. Make the cupcakes: In a large mixing bowl, whisk together the almond flour, coconut flour, tapioca flour, sweetener, cinnamon, cardamom, salt and baking soda. In a smaller bowl, whisk together the eggs and olive oil. Pour the wet (egg/oil) mixture into the dry (flour) mixture and stir until thoroughly combined and no lumps remain. Use an ice cream scoop to evenly distribute the batter into the 12 prepared muffin compartments. Each compartment should be about 3/4 of the way full. Bake for 15 minutes or until a tester comes out clean. 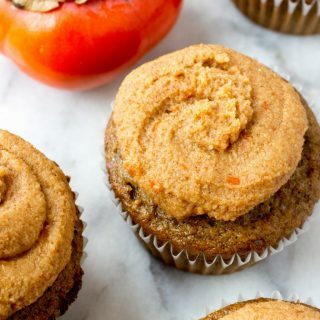 While the cupcakes are baking, make the frosting by beating together all all of the ingredients except the coconut flour in a mixing bowl or stand mixer. Add the coconut flour, 1 Tablespoon at a time, waiting until each is thoroughly incorporated and the frosting has thickened before adding the next one, until frosting reaches your desired consistency. Cool cupcakes completely on a wire rack before frosting and garnishing with an additional slice of persimmon. It's best to frost and garnish immediately before serving if possible. If you prefer a more subtle olive oil flavor, use virgin olive oil instead of extra virgin. These should convert to a vegan version easily by replacing the eggs with your favorite vegan egg replacement. Most brands of bourbon are not gluten-free, with the exception of Marker's Mark, which is safe for you if you are intolerant to gluten. I have heard that Wild Turkey is too, but am having trouble confirming for sure, so use at your own risk. Store frosted or unfrosted cupcakes in an airtight container in the fridge for up to 2 days, or store unfrosted cupcakes in an airtight container in the freezer for up to 3 months. These cupcakes, and especially the frosting, dry out easily, so keep them covered/sealed as much as possible. Admittedly, you don’t see persimmons every day but I was grateful to be send a bunch of persimmons along with my shipment of yuzu from Melissa’s. Melissa’s, a Los Angeles-based company which specializes in unique, seasonal produce (and other foods). 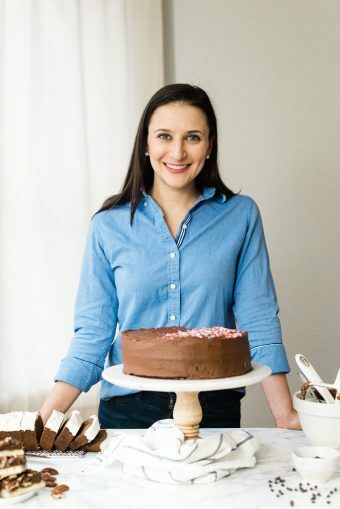 You can buy persimmons, yuzu, and a variety of other seasonal fruits, vegetables and specialty foods grown in the USA from Melissa’s website, and they’ll deliver straight to your door. If you’re in the midwest, aka Chiberia right now, you completely understand the magic that the delivery of fresh produce to your doorstep represents. If you’re interested in trying some new flavors for yourself – and hopefully making these cupcakes! – you can visit Melissa’s at www.melissas.com. Thanks for supporting the brands that help make A Clean Bake possible. Wow! These are gorgeous. With that bright orange and the taste of bourbon. . .I can envision these as the perfect treat in the fall. Are persimmons available at that time of year? I see them in the grocery stores but have not been brave enough to cook with them. Wait… WHAT. My mouth literally dropped when I saw the title of this. And let me tell you it dropped for the best reasons. I am truly blown away by your creativity and the cupcake alone sounds so intriguing and delicious. Olive oil cupcakes…brilliant. Oh thanks, Selena! Well, I’m not sure everyone loves olive oil as much as I do, but a really fruity oil works so well (IMO) in sweets. I wish I could have shared these with you! 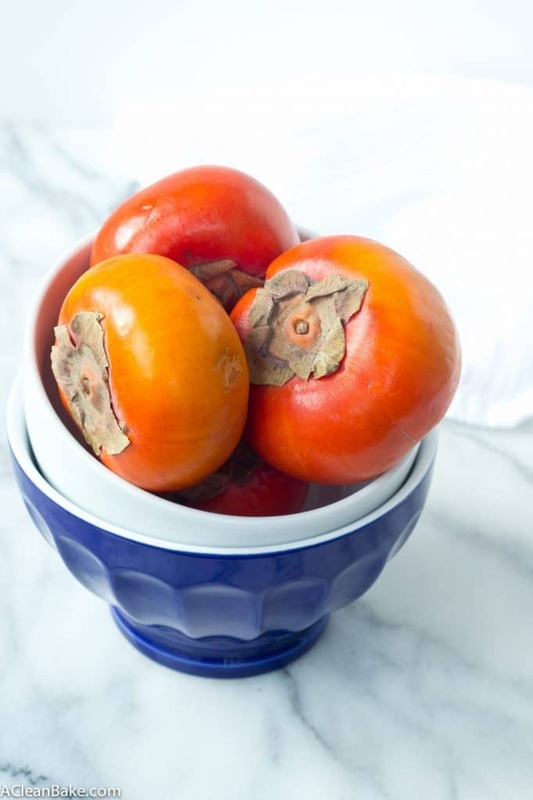 Persimmons are my favorite fruit! I never thought to pair it with olive oil before. Brilliant! Wow, for someone who’s never had persimmon, I think you’ve really sold it with your description. What a clever way of incorporating it into the cupcakes subtly and deliciously (: The texture sounds amazing too! Thanks, Monica! I may be late to the persimmon party, but I hope to be able to make up for lost time. I LOVE these little fruits! Ah! I was waiting to see what you were going to do with the persimmons on IG! These look so great!! And really, can you ever go wrong with bourbon? 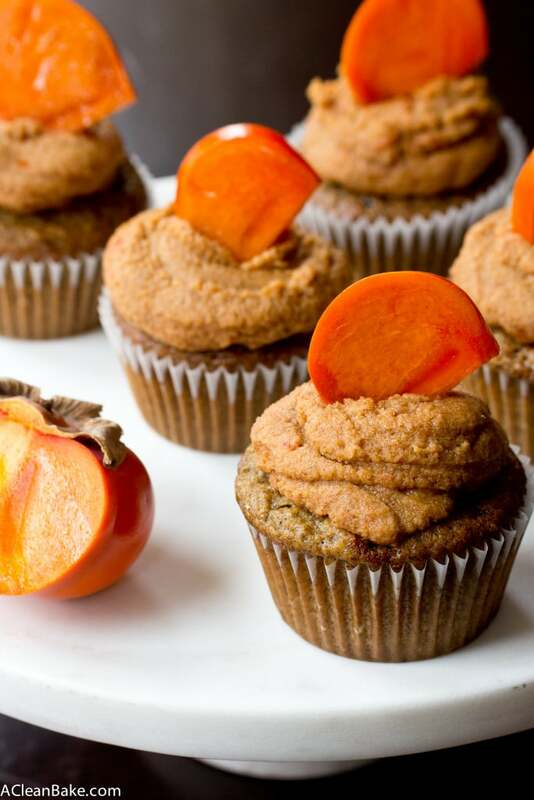 That picture of the persimmons in the blue bowl is absolutely gorgeous – makes me want to go buy some right now and whip up these cupcakes! I didn’t know bourbon isn’t gluten free. Fun fact to go along with these gorgeous cupcakes!! Love the olive oil and spices! Such a winning combination!